Three days in Bangkok is not enough time to get to know the full street food map of this chaotic city, but it is enough for us to rethink the basic idea that we westerners have about street food: whilst here in Italy, all it takes for us to give the name street food to something is for someone to tell us it was born out on the street, in Bangkok the food really does live on the pavement. 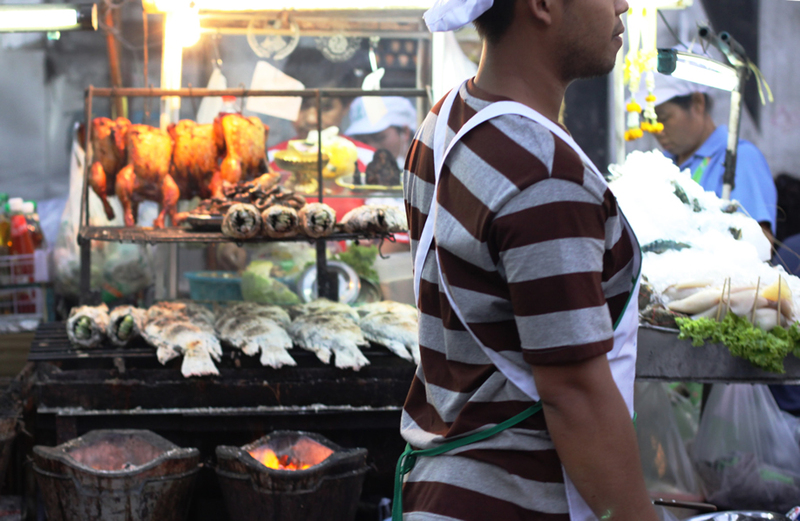 Here, along with the people, the food is mobile; visible in the streets, at crossroads, inside the markets. Work starts in the early morning: on my second day in the city, I got up and went out for a walk with my reflex camera and a light bag, in search of a true Chinatown, and I found my path filled with hardworking hands, kind smiles and all different types of smells. At 7.30 in the morning, whilst I bought rice-flour pancakes filled with corn and covered with grated coconut and spiced sugar, at a neighbouring table, people were eating piping hot soups. All the food exists in little carts, equipped with an ingredients counter, a stove, a grill and a worktop where the recipes are prepared. At dawn, women and men organise the vegetables they will chop for the soups at the time of cooking and cook the meat they will slice with a cleaver: it is all very focused, rapid and quiet. 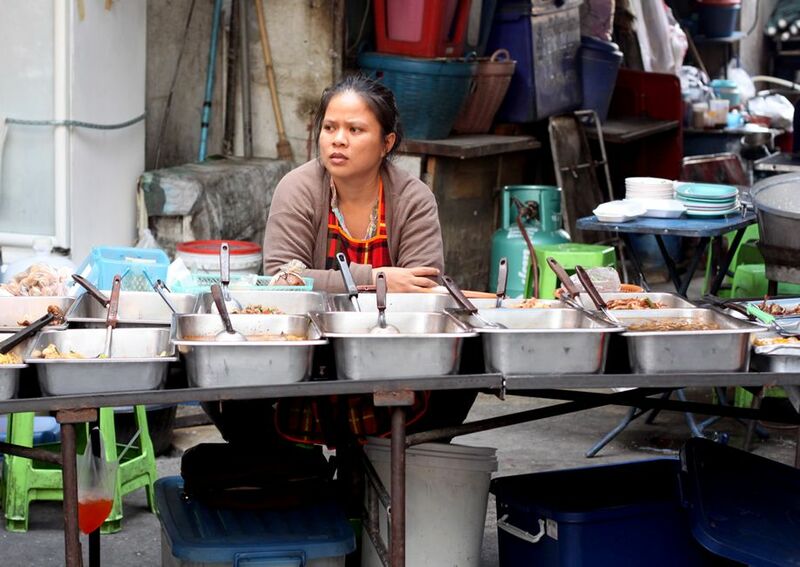 I chose to get as much material as I possibly could into my photographs: here in Bangkok, where the relationship between hand, tool, street and table is strongly tied to the figure and gaze of the cook / owner, I wanted to capture the people at every possible opportunity. First of all, I always ask permission; it may seem unimportant, but the person who cooks is also the one who serves, looks after the till and checks whether the tables need clearing. If he feels that a photo might get in the way of his work, I avoid taking it. For this reason, I always ask first, and I have always found friendly smiles and willingness that is both reserved but conveys a certain happiness. 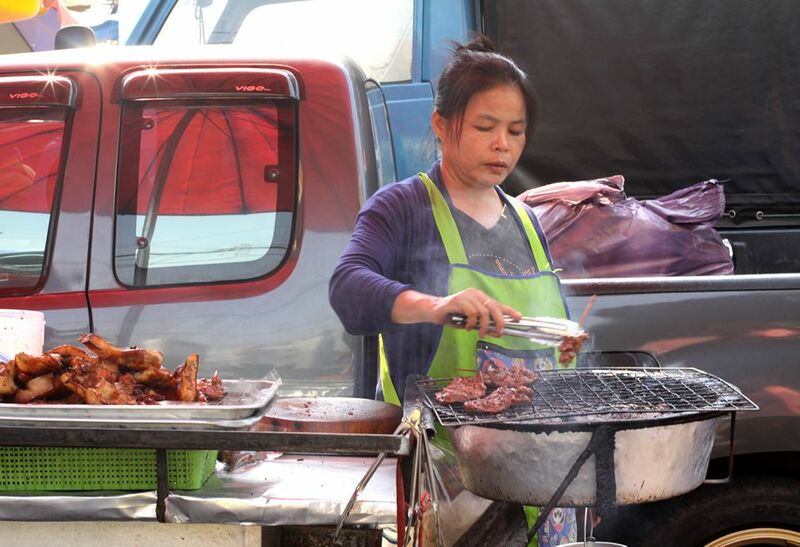 No one ever looks you in the eye, unless they are children, and therefore they focus much more on what they are doing: turning pork skewers, for example. One of the most amazing foods I tasted I ate thanks to a couple from Singapore, who helped me out when they saw me lost in the menu: they told me what to order and gave me a plate with a bit of fish that they had just been served. 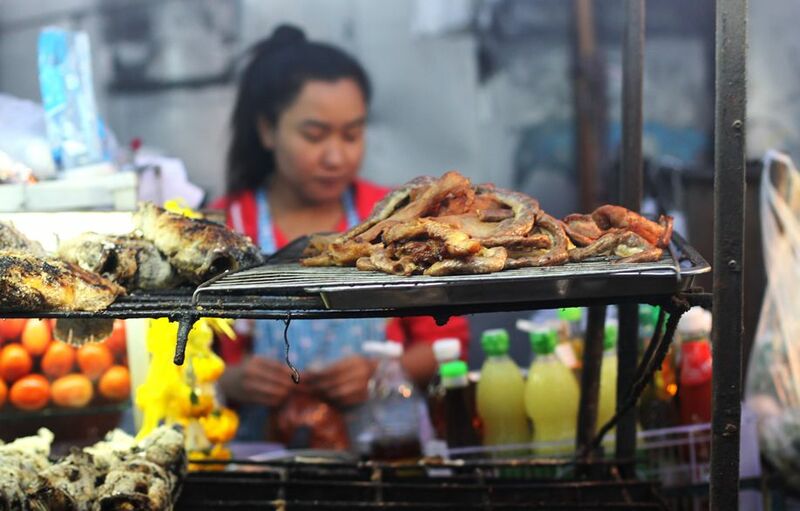 It was a sea bream type of fish, cooked on a grill after being stuffed with lemongrass and other herbs; the result was pleasantly seasoned and very tasty. In the photo below, I chose to leave the waiter in the foreground, taking the shot using a very fast shutter speed that allowed me to capture just him and the cart and not the hundreds of people passing by! When there is no menu – and it happens a lot – you have to trust your aesthetic sense: you choose the food based on colour and consistency, where possible, and you indicate by pointing, seeing as many sellers don’t speak English. 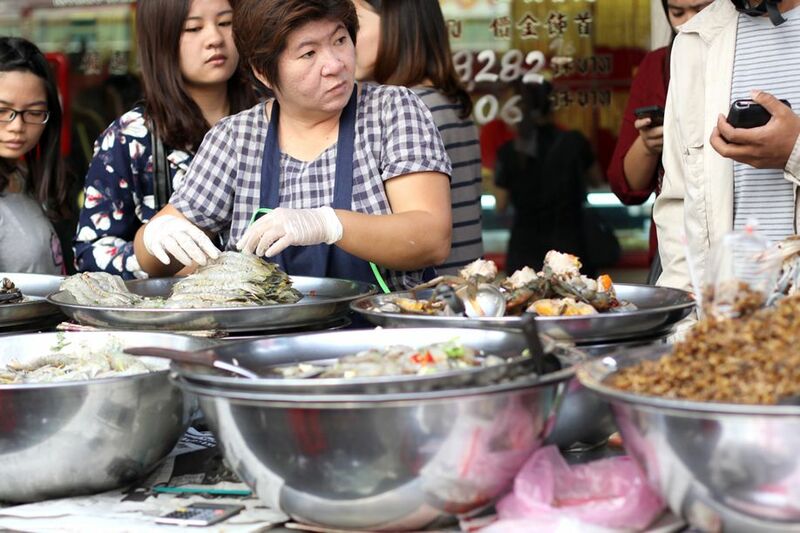 That is what happened in Chinatown, where I took this photo: I positioned myself right in front of her, and I left her in the centre of the image, taking in all of the backstage of dirty dishes and plastic containers. When showing street life, you have to be honest: I could have focused on her from above, together with a bit of my colourful food, but I preferred not to lie. 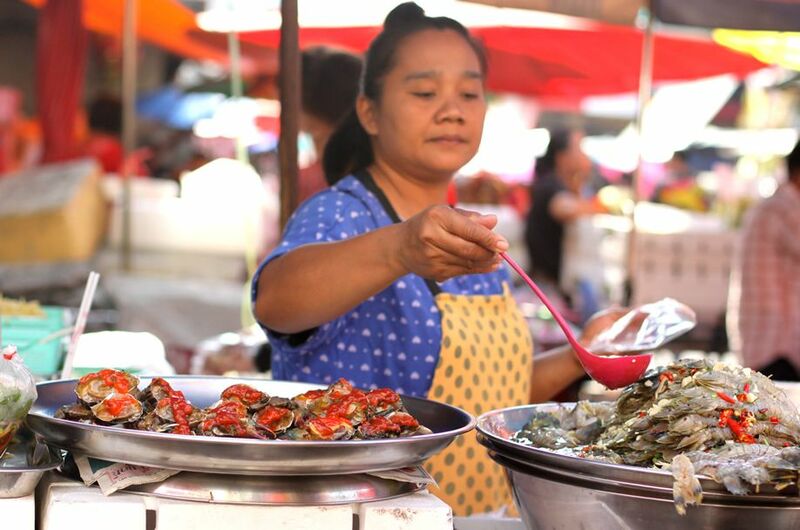 The street food in Bangkok consists of noodles, soup, grilled meat and lots of fish: fresh, odourless, and often already seasoned with chilli pepper or salsa. For both of the photos below, I widened the aperture and set the focus manually, moving laterally in relation to my subjects, in order to take in their hand movements, and trying to capture the flow of people, on the one hand, and the religious concentration on the other. In the photo of the girl with the ladle, in particular, I used the oldest tip in the book for food photography: hands in the foreground, food immediately behind. I took the last two photos on the sly, because I feared distracting the boy and the elderly man from their work. 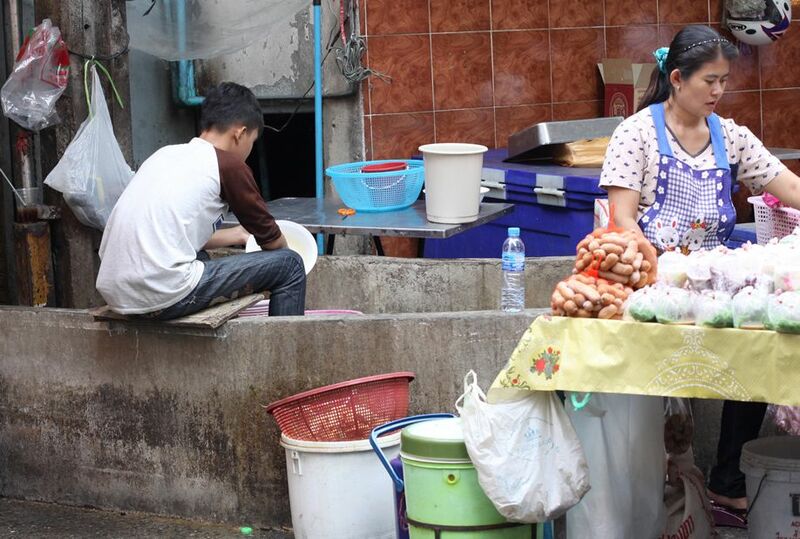 The boy was washing the dishes as you do in the streets in Bangkok: in stone baths by the road, carrying the dishes in big tubs and rinsing them in a fairly superficial manner – yes, the hygiene leaves a little to be desired, but I never suffered any ill effects! 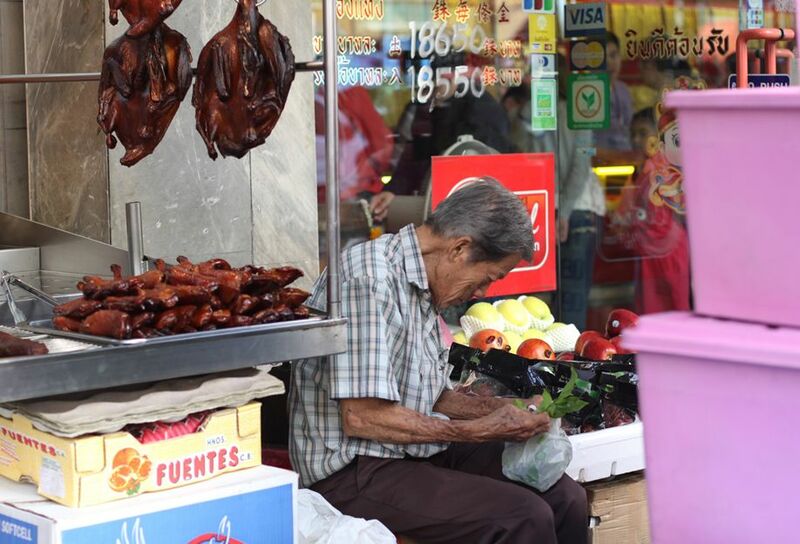 The elderly man was checking over some leaves, under the watchful eye of a roasted goose. Both pictures include other incorporated subjects, both live and made of plastic; I could have cropped the image by getting closer up, but I wanted to leave the subject at the centre of a scene of ongoing activity. Therefore, I positioned the boy to the left of my composition and the elderly man in the centre, letting the street life flow by. Then I carried on in my hunt for food; but that’s another story.